These natural cycles have been compartmentalised into beginning, middle and endings, from walking the dog to our finite lifespans and everything in between. The matrix has been constructed to control our lives through a linear, locked down context. The elite have divided our lives up, boxed us into a tightly structured linear design, in an attempt to control us and limit our thinking. This is inherent to our experience of the third dimension and has been exploited by the ruling elite to further imprison us. We have been disconnected from the natural cycles of the planets, seasons and sun rises. We have been brought into a matrix of alarm clocks, second by second compartments that have to be filled. We clock in and clock off. We use bells on our children to cut up their day into slices, segments. They get a certain time to eat. Then its back to work or play. This is how the programming starts early at school in the west. We are plugged into a linear system of manipulation and control. Free thinkers, travelers of the mind, artists, free radicals, earth warriors can exist in niches outside the daytime stepford living or base survival mode. The matrix allows a little flexibility in their routines and cycles, this is compartmentalized creativity. Economic, cultural and religious pressures limit this free thinking creativity. The Islanders, as Huxley named them in Brave New World. Routine is good, it’s healthy but being a slave to a system that drains your life energy is not so good. A system that makes you chase numbers to survive. Rating us and dividing up the pie depending on chance of birth. A caste system of population control. The linear system underpins this process, it creates boundaries, blocks and bars to keep us hemmed in, like cattle. We can begin to understand the limitations of a linear timeline. It limits us metaphysically, spiritually and leaves us vulnerable to manipulation. Linear time puts a dam in the flow of existentialist thinking, it blocks the flow of possibility by locking us down. The philosophy of reincarnation opens us to an extension on the elite’s preferred narrative of birth, life, death, scary, judgemental masculine god. The rules and regulations, the consequences and fear mongering in many religions prevent people opening their minds to past life’s, multiple lifetimes, quantum multi verses and intergalactic community. Ancestral and genetic data also shape our perception of ourselves and our existence, yet it too is cornered by the past and present linear context. We have learned behaviors, familial behaviors, genetic inheritance to ground us into a present formed by the past. A spiral perception illuminates a more complex, convoluted, multidimensional context to our lives on Gaia. It helps us to probe outside of the matrix box, to see beyond the parameters of programmed control, to a deeper, karmic, energetic, conceptual perspective. But what of the future? What if we throw knowledge and recognition of the future into the mix? Add a layer to our linear outlook, extending it forward. Knowing the future is the game changer (as the recent film Arrival explored). When we know the future, this knowledge will change how we manage the present. Knowing the future changes the present, makes it more fluid. Awareness of sliding doors moments and what they mean. Seeing and understanding simultaneous infinite timelines based on decisions made in the present changes everything. We make the leap into the quantum. Now we don’t see behind us and where we are, we see all round us, above us and below us, we see angles and trajectories of timelines, paths sparking off our present thoughts and behaviors. Like lightning bolts burning off leaving their mark. Each timeline meaningful and fluid. We become quantum beings, able to see into multi space, all around us, each infinite choice. In the matrix hologram, the third dimension, we are in a prison of sort, a linear illusion. With quantum perspective, higher dimensional higher frequency vibration, we are in a multi dimensional space. The limitations of the 3rd dimension no longer apply, we are not locked into a linear existence anymore. Knowing or seeing the infinite possibilities of the future, fundamentally would change our decision making processes, our world view and our experience of reality. Manifestation would become very real, immediate and powerful. This was illustrated by the Linguist, in Arrival, changing her past because she knew her future. Add time to this equation, knowledge of the future gives you time back, moving forward or backwards, sideways, up and down or staying still. Does time dictate a linear reality? Can time loop? Can time fluctuate, slip, speed up or slow down? Gravity also applies when considering specific lifetimes in a fixed space in time. Where we are in the multi verse, different planets or space travel could also affect our perception of time. This is the rabbit hole of the space time continuum. Within this complex, convoluted, infinite vastness of quantum space and time are there fixed points that we will travel to no matter what path we take? Are these preordained? Part of a bigger mind body spirit growth evolution thing. Is there design in the multi verse as the fibonacci sequence suggests? Do we have fixed points that somehow connect this intricate multi dimensional web on the space time continuum that we exist in? Much of what we think we don’t know, we do know… its hidden in plain sight. Old wives’ tales like ‘sliding doors’, ‘it’s meant to be’, ‘what’s for you won’t go by you’ or ‘that one is an old soul’. Is there truth in these ancient tales? Fixed points, interactions, spaces and places we will always be part of no matter our choices? To be free thinkers, is to release conventional thinking, peer over the panoptican walls and question everything! Quantum is big. Its huge. It bakes your noodle, bends your mind, trips you out. It’s the ‘spoon does not bend, you do’, Kansas is going bye bye, red pill moment. It makes you think beyond the boxes our minds have been trained to remain in. It challenges us to question who or what we are, how we fit in, what the bigger picture is. This is healthy, this is organic, its evolution. To be quantum, to exist in a multi dimensional world is achieved by raising our frequencies, the vibrations of our cellular system. Dictated by our thoughts and environment we can raise our vibration in many ways. If we think about this, adding it to past present and future with all its infinite directions, we have to add a layer of dimensionality to this intricate quantum web. We can be moving between different frequency fields at any given moment. Maybe remaining fixed in space but not in time or vice versa? We may be existing simultaneously in other lifetimes, we may even crossover occasionally. The bubble theory of parallel realities, worlds, existing next to each other, always expanding, moving, interacting. Or think of a computer program, a sims where you can have several levels occurring at once. The third dimension matrix reality, buying potatoes for dinner, the fourth dimension, interacting with passed on relatives, fluid and more ethereal in nature, or the fifth dimension where there is a pervading sense of love and abundance, peace and tranquillity. Could we be in the akashic records buried in a book, whilst simultaneously riding a Harley Davison down route 67? It’s about awareness, expanded consciousness. What are we aware of? In this reality we are aware of past, present and possibilities of our future. What we know are memories of the past, what occurs in the present and dreams, expectations of our future. If we saw our future, we could change it, ‘back to the future’ style, and therefore change our past (remember his brother and sister disappearing from the photo?! ), which is when our noodles start to bake (again). Infinite possibilities, ever changing, parallel dimensions, higher frequency existence. It all gets very convoluted. Just to further stir the mix, throw in a general helping of other planets, other solar systems, other universes, maybe right next to ours, intergalactic populations, hidden from us in this matrix and our noodles are officially burning up. Councils of intergalactic representatives meeting to discuss what to do about planet earth and its chaos and destruction? Spacecraft that can jump time, loop dimensions and snap in and out in the blink of an eye? Throw in some inter racial politics, some good versus evil and a big dollop of technology, AI and well…it all gets very complex, and intriguing, indeed. 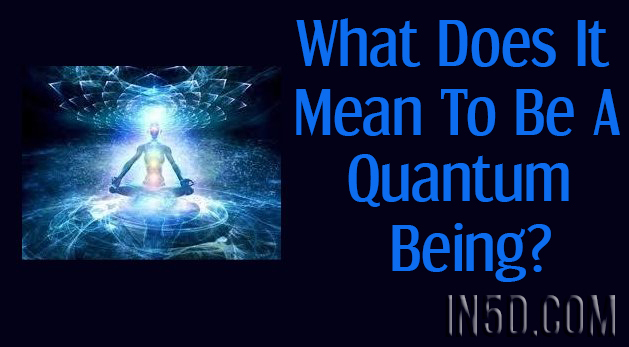 When the word quantum is used it can encompass all of the above. It is a general recognition that the universe is multi layered, multidimensional and multi everything really. All possibilities covered and the ones you haven’t thought of yet. We can meditate upon it, research it, think about it, argue about it and investigate. The main thing is we are talking about it. That alone means the tight hold linear thinking has had on us is waning, cracks are beginning to show. As people begin to question – what about the past, before this life? What about the present, the impact my behaviours have? What about the future, is it set in stone or can I change it? This is liberation of thought, expansion of consciousness, opening our minds to quantum possibilities. This is waking up, unplugging, deprogramming. Quantum is cyclical, multi dimensional, geometric in its design. It is physics, math, spirituality, cellular frequencies and karma. Becoming quantum beings requires we lighten our karmic load to enable us to access higher frequencies and dimensions. We are in this process, propelled by cosmic waves of ascension, awakening and upgrades. This is the beginning of the new world, let’s make it a.maz.ing! Sending love and light beautiful people. About the author: I am a dedicated café conspirator, lightworker, metaphysical explorer, teacher, writer and earth mother. Born and bred in Glasgow, Scotland, I spent time travelling in Australia and Europe before moving to East London. After 15 years as an English teacher and head of year in comprehensive secondary schools I left teaching to become a stay at home mum. I retrained as a meditation teacher and reiki energy healer, using crystals and starseed tarot cards for healing and channeling. Between night feeds and school runs I have been writing and blogging about life, the universe and everything. You can find me on Facebook, wordpress and youtube at awakening5dhealing. Much love and light beautiful people. Tags: Akashic records, ascension, cosmic waves, cosmic waves of ascension, dreams, fibonacci sequence, karma, love and light, multidimensional, parallel realities, raise our vibration, reincarnation, space time continuum, third dimension, timelines, What Does It Mean To Be A Quantum Being?